UPDATE, 2/23 @ 11:42 AM: It’s still snowing. The snow showers are coming and going, and each one hasn’t left more than a 1/4” of new snow on the ground but there is some additional accumulation. The parks are still open and photo conditions continue to improve. The forecast for tomorrow and Sunday are sunny and partly sunny, respectively. I predict that winter photography conditions in the Moab area will be at an all-time high this weekend. GET HERE NOW. UPDATE, 2/22 @ 8:00 AM: Overnight we received some new snowfall amounting to no more than 1” accumulation. There is additional snow predicted today although it isn’t likely it will amount to much. Arches and Canyonlands National Parks are open. Both parks advise that the roads may be icy in areas. UPDATE, 2/21 @ 4:30 PM: Moab is currently under a winter weather advisory and we are expected to receive 2-6” of new snow out of this storm. It’s snowing lightly now. I will update this post with current conditions and park access information tomorrow morning. 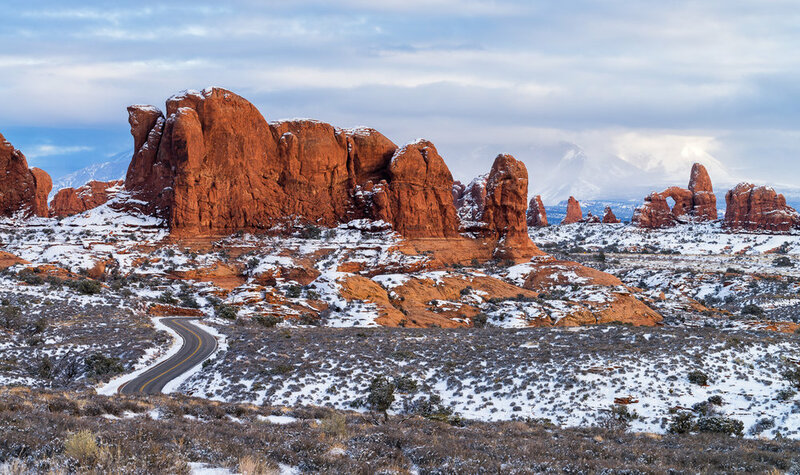 UPDATE: Arches National Park is open as of around 3:00 PM today, Feb. 19. The latest update from Canyonlands - Island in the Sky indicates that the park road is still closed due to snow. Conditions are generally top notch for landscape photography. Actually, I’d go so far as to say that these are some of the best winter photography conditions I’ve seen in Moab. There’s ample fresh snow on the ground, the sun is out and cotton ball clouds are floating through a brilliantly blue sky. In addition to the snow that is predicted to fall tomorrow, the ten day forecast is calling for very cold temperatures, which means this snow is going to be around for a while. That’s the good news. The bad news is that Arches and Canyonlands National Parks are currently closed while crews work to clear the park roads. This is as of 1:00 PM today. Both parks are expected to open as soon as the roads have been plowed, though expect snowy and icy conditions on the roads and trails. I’ll do my best to update this post as information about roads, trails, parks and conditions becomes available to me. I also recommend that you check out the following social media accounts as you should expect updates from them as well. The Moab PD is really good about updating road conditions and closures in the Moab area. If you can’t access the parks, there are several locations worth photographing outside of the park boundaries. Highway 128 offers the Fisher Towers and Castle Valley, as well as several opportunities to photograph the Colorado River and unnamed sandstone features. Highway 128 is notorious for black ice and rockfall, so please use extreme caution. Corona Arch in this much snow will be a real treat. Kane Creek also has many opportunities to photograph the river as well as side canyons with lots of cottonwood trees that make interesting intimate landscapes. I wouldn’t recommend continuing on Kane Creek when the road transitions from pavement to dirt as there is significant exposure, no guardrails and it’ll be super slick. For tips and other ideas on winter photography in Moab, be sure to check out this blog post: The Photographer’s Guide to Winter in Moab. Last, but not least, I hope you’ll consider supporting me as I deliver these real time updates and other valuable information by purchasing one of my ebooks. They’re only $15/each and are loaded with high quality content to help you find and photograph the best locations in each park. Moab nature and adventure photographer Bret Edge provides an update on current photography conditions in Moab, Utah.